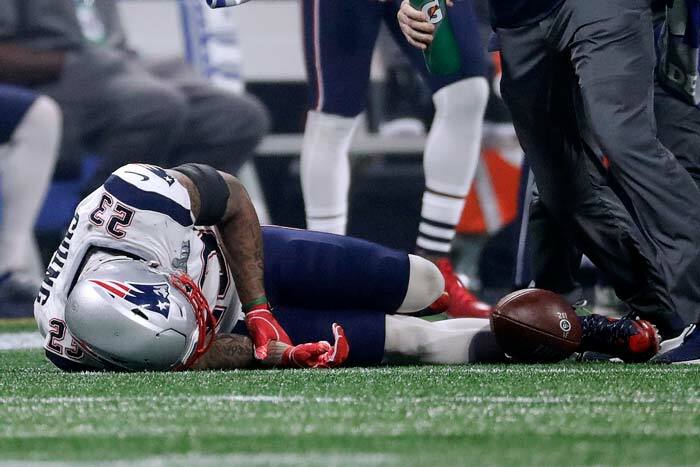 For those who may have dozed off … the Patriots have won the Super Bowl. Julian Edelman caught 10 passes for 141 yards; he was the day’s only consistent offensive threat. 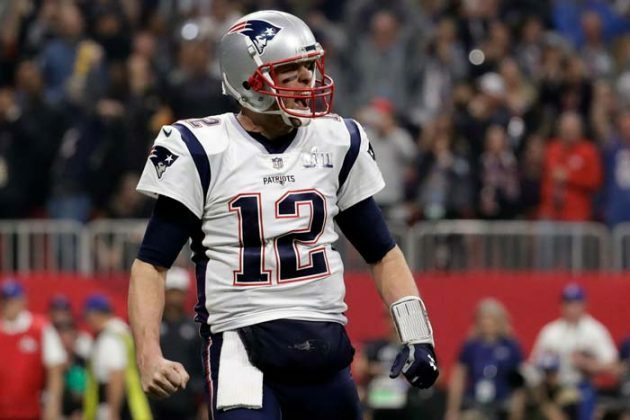 Brady engineered the game’s lone touchdown drive —a five-play, 69-yard march punctuated by an over-the-shoulder, 29-yard throw into the hands of tight end Rob Gronkowski. On the next play, Sony Michel scored on a 2-yard plunge with 7 minutes to play for a 10-3 lead. 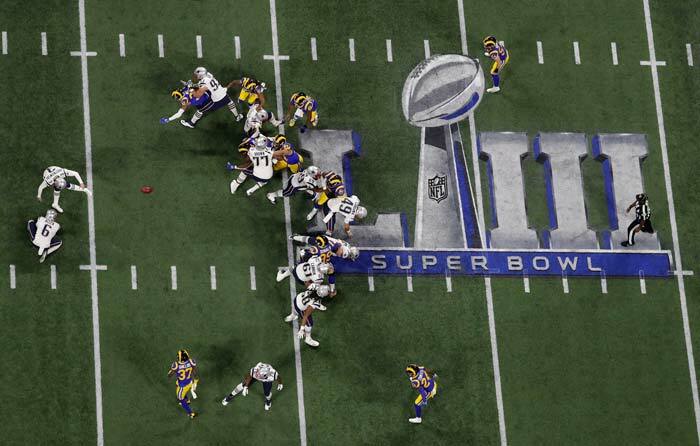 After New England’s score, Goff moved the Rams down to the New England 28 with 4:30 left. 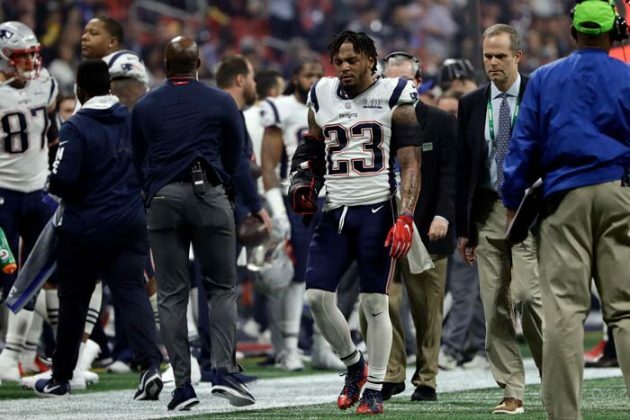 But the third-year quarterback threw one up for grabs near the end zone and cornerback Stephon Gilmore stepped in front for the interception. Tom Brady and the Patriots finally turned up the offense to end the Super Bowl’s longest touchdown drought. The first Super Bowl without a touchdown through three quarters was in dire need of a boost. Then Brady completed four consecutive passes to set up Michel’s touchdown plunge. The drive opened with an 18-yard catch by Rob Gronkowski, who added a 29-yard diving catch at the 2. The big play of the Rams’ scoring drive was Jared Goff’s 18-yard pass to Robert Woods on a third-and-7 play. 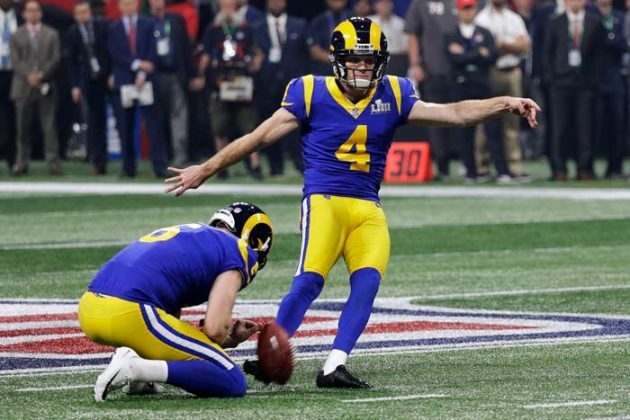 The Rams had been stopped on their first eight third-down plays of the game. Chung suffered the injury when his right arm was caught between teammate Jonathan Jones’ helmet and Rams running back Todd Gurley’s helmet on a tackle. New England leads Los Angeles 3-0 on a 42-yard field goal by Stephen Gostkowski, making for the second-lowest scoring first half in the game’s history. Only Pittsburgh’s 2-0 halftime lead over Minnesota in the 1975 Super Bowl — won by the Steelers, 16-6 had fewer points. The Patriots kicker missed a 46-yard attempt late in the opening quarter, but made up for it by capping New England’s seven-play, 39-yard drive with the first points of the game. Julian Edelman, who had two catches for 31 yards on the drive, passed Dallas’ Michael Irvin for the second-most receiving yards in NFL postseason history. Only Jerry Rice has more than Edelman. New England’s Tom Brady was sacked for the first time this postseason, going down when Los Angeles’ John-Franklin Myers knocked the ball out of the quarterback’s hands late in the first quarter of the Super Bowl. It was the first time Brady was sacked in a postseason game since last year’s Super Bowl loss to the Philadelphia Eagles. Brandon Graham ripped the ball out of Brady’s hands for a fumble that was recovered by Derek Barnett — sending the Eagles to their first Super Bowl title in franchise history with a 41-33 victory. 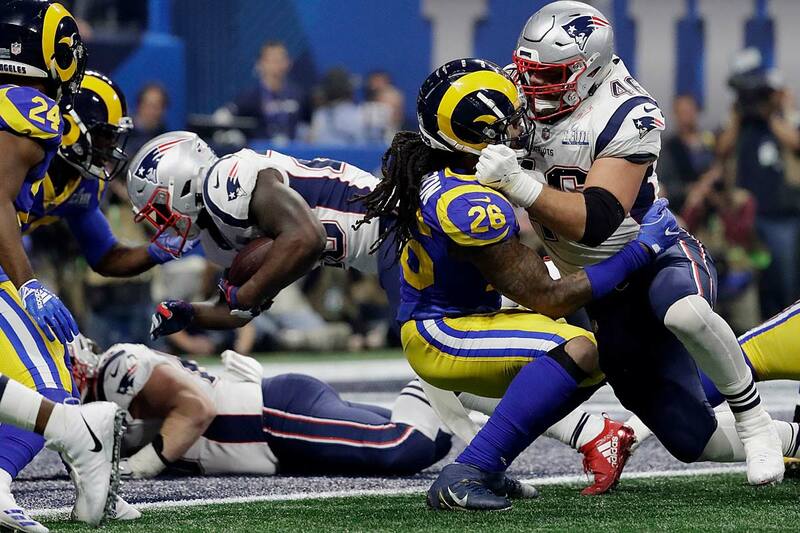 New England, which had the ball for 11 minutes and 47 seconds, still hasn’t scored a touchdown in the opening quarter in its past nine Super Bowls. The Patriots have been outscored 24-3 in those games — with the only points coming on a field goal by Stephen Gostkowski last year against Philadelphia. 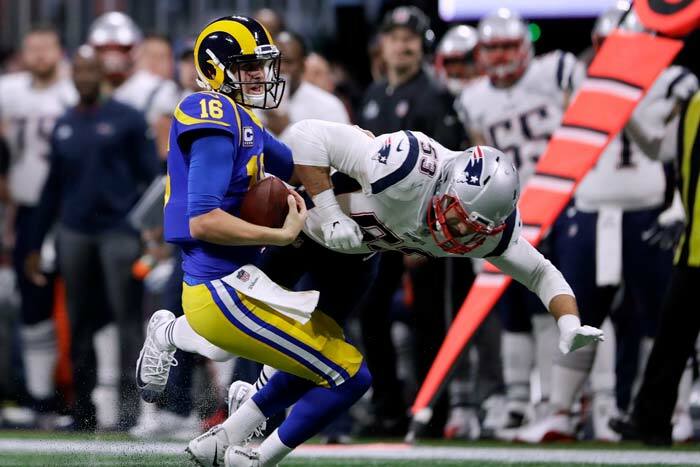 After the Patriots’ first offensive possession ended in an interception by Tom Brady — just the second on the opening drive of a playoff game in the quarterback’s career— the Rams went three-and-out. 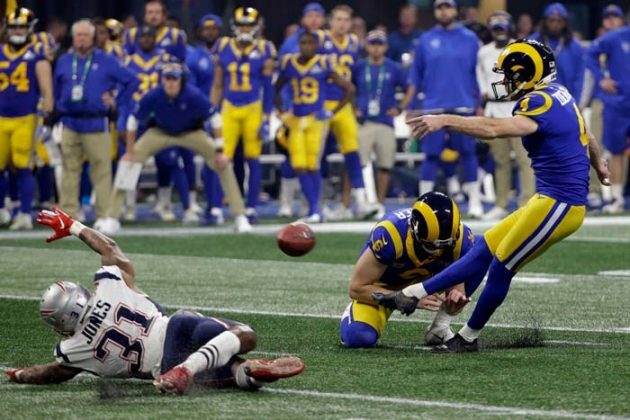 New England got the ball at its 12, and questionable officiating quickly became an issue when Rams cornerback Nickell Robey-Coleman was penalized for hitting a defenseless receiver after Brady’s pass to Rex Burkhead on second-and-14 went for a 4-yard loss. Robey-Coleman was involved in the now-infamous play during which he was not penalized for his hit on Saints receiver Tommylee Lewis. No flag was thrown for pass interference for the helmet-to-helmet nature of the hit — for which Robey-Coleman was fined $26,739 by the NFL — possibly altering the outcome of Los Angeles’ 26-23 overtime victory. Dr. Martin Luther King Jr.’s youngest daughter Bernice King and civil rights pioneers John Lewis and Andrew Young stood at midfield with the players for the toss. 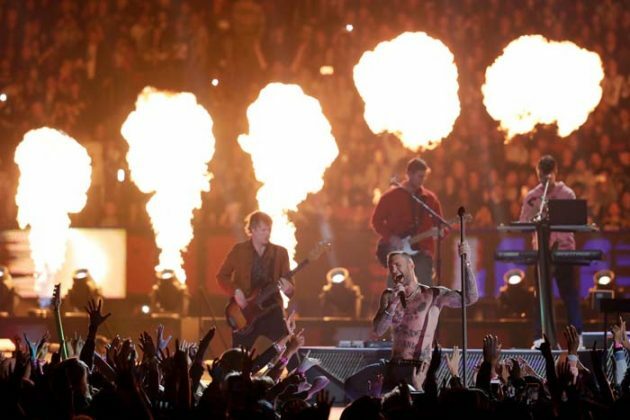 Dave Grohl was still floating from the Foo Fighters’ star-studded show the night before as he walked toward Mercedes-Benz Stadium. “Hopefully somewhere where there’s cold beer and jalapeno peppers,” he said with a grin. Defensive tackle Danny Shelton and defensive end Deatrich Wise Jr. both returned to the Patriots’ active roster after missing the AFC championship game. Also active were linebacker Dont’a Hightower, who missed a practice this week with an illness, and defensive lineman Malcom Brown, who was limited with a calf injury. New England’s seven inactive players: tight end Stephen Anderson, offensive lineman James Ferentz, safety Obi Melifonwu, defensive linemen Ufomba Kamalu and Keionta Davis, defensive end Derek Rivers and defensive back Duke Dawson. Los Angeles’ inactives: defensive back Darious Williams, running back Justin Davis, linebackers Ogbo Okoronkwo and Trevon Young, offensive lineman Jamil Demby and defensive tackles Sebastian Joseph-Day and Tanzel Smart. The over-under for Knight’s rendition of the national anthem is set at 110 seconds by Bovada — one of many side-action wagers available for today’s Super Bowl, the most heavily bet event of the year. If you believe President Trump’s tweet count will be higher than the number of Tom Brady touchdown passes, then you can wager $140 to win $100. The NFL has announced plans for Mercedes-Benz Stadium’s retractable roof to be open for the pregame show, including a flyover by the Air Force Thunderbirds, and then closed for the game. NFL spokesman Brian McCarthy says the plan is to have the roof closed for the teams’ pregame warmups on the field. The retractable roof then will open for the pregame ceremony. The Thunderbirds practiced the flyover with the roof open on Saturday night as close as possible to the planned time for Sunday’s pregame show. Falcons President and CEO Rich McKay is confident it won’t take nearly that long for the big game to return to the A-T-L for the fourth time. He expects Atlanta to become a regular part of the Super Bowl rotation with cities that are warmer in the winter, such as Miami, New Orleans, Phoenix and perhaps Los Angeles. He points to all the downtown facilities that are within walking distance of each other, including the stadium, numerous hotels, the Georgia World Congress Center, State Farm Arena and Centennial Olympic Park. All played major roles in this week’s Super Bowl activities. Atlanta hosted the college football championship game last year, and the NCAA men’s Final Four will be at Mercedes-Benz Stadium in 2020. The city is also expected to have a major role in soccer’s 2026 World Cup. No matter what happens in today’s Super Bowl, Patriots coach Bill Belichick will be on top of the record book. If the Patriots lose, Belichick will also find himself sharing space the top of the ‘L’ column with his fourth loss. There are some pretty good names there, though: Don Shula, Bud Grant, Marv Levy and Dan Reeves. The Los Angeles Rams will attempt to cap their remarkable two-year turnaround under coach Sean McVay with their franchise’s first Super Bowl championship in 19 years. The Rams had been through 13 consecutive non-winning seasons and hadn’t won a playoff game in 12 years before they hired McVay, who was 30 at the time. The youngest head coach in modern NFL history immediately engineered a seven-game improvement last season. Today’s game between the Rams and Patriots marks the eighth rematch in Super Bowl history. —Redskins 27, Dolphins 17 in Super Bowl 17; a rematch of Miami’s perfection-capping victory in Super Bowl 7. —Giants 21, Patriots 17 in Super Bowl 46; a rematch of New York’s win, which spoiled New England’s run at an undefeated season, four years earlier. —Cowboys 30, Bills 13 in Super Bowl 38; a rematch of Dallas’ crushing of the Bills the previous year. —Eagles 41, Patriots 33 in Super Bowl 52; a rematch of New England’s win in Super Bowl 39.